Saturday night just might have been one of the absolute coolest nights of my life! Seriously! 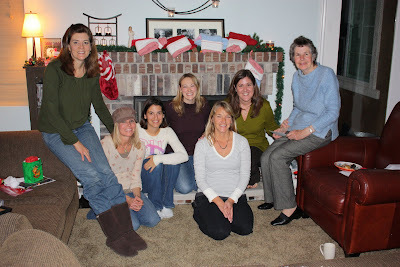 Tara and I invited four older, wiser women over for tea and dessert. We had the fire going, Norah Jones was playing faintly in the background. We moved all our couches in around the fire place so that we could see and hear each other as we talked. We had nine questions that we wanted to ask these women... we spent the next three hours getting through four of them. We started out light hearted and talked about some Christmas traditions that they did with their families then moved on to some deeper heart issues. We asked them what two of their favorite things about their spouses were, and two of their favorite things about being a mom were. We asked them what the biggest struggle in their marriage had been and how the Lord had brought them through that struggle. Then we spent time in genuine, fervent prayer for one another. If the topic is right, I can often times be a total chatter box. But on Saturday night I was enjoying the opportunity I had to soak up every word. I listened intently and asked the Lord to use these women, their struggles and their joys, to challenge me and minister to me. It was a blessing beyond anything that I could have asked for. We were blessed with a special guest, Lynn. She was visiting one of the women that we had invited. She had come all the way from New Zealand, she'd been married for nearly 50 years, she had four grown children, and she was humbly overflowing with great wisdom. It never ceases to amaze me how when you meet people for the first time and you have Christ in common, you can almost instantaneously become dear friends. I could have stayed up into the wee hours of the morning listening to all five of the women that were in our home on Saturday night. I'm so thankful that we don't have to go through this life alone. I'm thankful for women that have gone before us, women that are passionate about their Savior, women that are willing to be vulnerable and genuine, women who are willing to speak truth into my life even when the truth is hard to take in. Thank you SOOOOO much my sweet friends for sharing your hearts and your wisdom with Tara and I. It was truly one of the best nights of my life!!! !